Entdecken Sie die Vergangenheit osmanischer Sultane auf dieser dreistündigen Führung durch den Topkapi-Palast und die Hagia Sophia Sultan Tombs in Istanbul. Tauchen Sie ein in den Lebensstil der Sultane, wenn Sie ihr vier Jahrhunderte langes Zuhause, den Topkapi-Palast, entdecken. In diesen geschichtsträchtigen Kammern und Höfen erfahren Sie mehr über seine Geschichte, die mit Skandalen und Hinrichtungen gefüllt ist. Sie werden die Schatzkammer des Palastes sehen, in der heilige Relikte, Gewänder, Juwelen und andere wertvolle Artefakte aufbewahrt werden. Dann begeben Sie sich zur Hagia Sophia und besuchen Sie die extravaganten Mausoleen, um die Gräber von fünf Sultanen zu sehen. Am Nachmittag treffen Sie sich mit Ihrem Reiseleiter in der Nähe des Stadtteils Sultanahmet, auch bekannt als Altstadt, oder nehmen Sie einen Abholservice in Ihrem Hotel in Istanbul auf. Fahren Sie an Bord eines klimatisierten Busses eine kurze Fahrt zum Topkapi-Palast, von dem Sie einige der besten Aussichten der Stadt auf das Goldene Horn genießen. Treten Sie durch das kaiserliche Tor in dieses ehemalige Wohnhaus der osmanischen Könige und beobachten Sie die zylindrischen Türme und die schönen Höfe. Erfahren Sie neben Ihrem Reiseführer mehr über die Generationen königlicher Familien, die zwischen 1453 und 1839 hier lebten. Dann betreten Sie die Schatzkammer und bewundern Sie die unschätzbaren Relikte und die Vielfalt atemberaubender Waffen. Sehen Sie den smaragdbesetzten Topkapi-Dolch, riesige mit Diamanten verzierte Kerzenständer und heilige Artefakte wie einen Fußabdruck aus Ton, der dem Propheten Mohammed gehört. Fahren Sie von hier fort und bewundern Sie eine Reihe von Literatur und Bademänteln sowie einen Besuch in den großen Küchen. 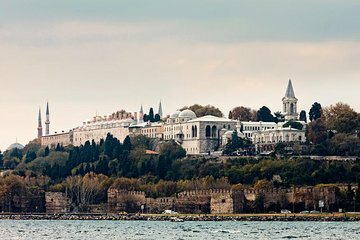 Nachdem Sie Topkapi verlassen haben, machen Sie einen kurzen Spaziergang zum Innenhof der Hagia Sophia und erkunden die wiederaufgebauten Mausoleen der fünf Sultane. Erkunden Sie mit Ihrem Guide die Gräber von Sultans Mehmed III., Murad III., Mustafa I, Selim II., Ibrahim I und ihren Familien. Gehen Sie hinein und stechen Sie die floralen Dessins aus dem 16. Jahrhundert in Szene, die das Interieur in einer Vielzahl lebendiger Farben sättigen. Genießen Sie die Gelegenheit, die Überreste der Gewänder jedes Sultans und Fragmente authentischer Wandteppiche zu beobachten, die aus Kaaba in Mekka stammen. Wenn Ihre Tour endet, verlassen Sie die Hagia Sophia Gräber und setzen Sie Ihren Tag entweder in Sultanahmet fort oder kehren Sie mit dem Bus zu Ihrem Hotel zurück. Det guiden berättade var intressant, men engelskan var inte den bästa tyvärr. Dessutom är det ganska stimmigt på platserna så du måste stå riktigt nära för att höra. Guiden lät merparten av gruppen vänta långa stunder när ett fåtal skulle handla, ta and quot;sultanfoton and quot; m.m. Det gick smidigt att ta sej in i Topkapi med förköpsbiljetterna och inne i trädgårdarna var guidningen ok.
Men till övriga utrymmen var det långa köer, och då övergick turen till and quot;egen tid and quot;. Dvs du hade lika gärna kunnat betala in dej själv, gått runt på egen hand, exv med audioguide, och sparat en del pengar. Bad oranisation of pick up. We wait in our hotel like planed, but no body came ,when we call them we knew that we are expected in an other hotel. We didn't arrive to find it , cause they give us just the name and tell us to ask people for the location , we return to our hotel so they pick up us 1 hour late. While visiting the guide was very kind and helpfull but not enough informative cause didn't enter with us into the palace . We regret this choice of visit it was a very bad experience for the price. The tour of the Tombs was somewhat of a waste of time. It was a room full of boxes with fabric covers. Who knows? Could have been orange crates. The local tour guide called in the tour of both the Topkapi Palace and the Tombs. Advice to the new traveler: do not take either tour. It doe not save you from any line other than the main gate at Topkapi Palce. All other sites have separate entrances. Go on your own .... a complete waste of US . Worst tour I have ever been on and I have been on numerous. We spent an 45 minutes on the bus as they went around picking everyone up and then sat for another 15 at their office as they transferred people on our bus. Our guide was not friendly and seemed to rush everything. We would have had more time to visit the sites if we wouldn't have had to sit on the bus forever. The guide conducted two tours at once. One in English and one in German which was very distracting. Our guide was in such a hurry due to closing times that he left three gentlemen at the tombs without trying to go and find them. Once we got to the palace he spoke briefly (10 minutes on the Palace then told us to go off by ourselves to finish the tour. I paid for someone to explain things and guide us around. I will never book another tour with Viator as we felt like cattle. I would highly recommend "My Local Guide Istanbul." They know how to conduct a great tour. I'm sorry to say this Tour was very disappointing and not up to our previous excellent experiences with Viator. We were staying in central Istanbul, 10 minutes walk from the Hipperdrome. After a shambolic start which involved 2 bus rides and waiting 30 minutes to meet up with other tourists who had been delayed, from a cruise ship I think, we started the Tour 45 minutes late. We were given no information at the time as to why we were waiting. However, the most disappointing aspect by far was the very inappropriate unprofessional guide. He spoke ridiculously quickly, firing off facts that people couldn't follow. He also wasn't open to questions and didn't engage with the Group at all. He really seemed to be looking to get the Tour over and done with as quickly as possible. However, the biggest disappointment was at Topkapi Palace which is spread out over a large area. We were again given many facts at a 100 miles an hour before being released to do our own thing for the rest of the Tour. Although Topkapi Palace is a very large and crowded venue, we weren't given anything on paper to take with us, not even a map ! It was all so very very disappointing. I really hope Viator is able to pursue this with the tour operator, identify the offending guide and ensure this cannot happen again. Such an experience is unfortunately very damaging to Viator's image. Guide was enthusiastic although not terribly full of information. The written description made it sound like the Hagia Sophia SultanTombs were different from Hagia Sophia Museum and failed to point out that like Hagia Sophia Museum, the Tombs are not open on Monday.. So we went instead to another mosque.